No, but it is highly recommended to avoid disappointment if you arrive and the session is fully booked out. You can also phone us to book on (08) 9707 3813. Remember, we do get busy on the hour, every hour. Yes, all jumpers MUST sign a waiver, or have one signed by their parent or guardian on their behalf if under 18. The Terms and Conditions must be read and acknowledged. Signing the waiver means you agree to our Terms and Conditions, which must be read and acknowledged. Sign the waiver online here, when you book, or at the waiver station when you arrive. If you are bringing children or teens who are not your kids, please remember to have the waivers signed by their parents before arrival. Tickets are not transferrable, however we get that things happen, people get sick, and traffic can hold you up so if this happens to you, please do contact us. If given enough notice, we are happy to switch your session to a later time if its not booked out, or another session, or offer a jump pass to use some other time. Please do contact us at explore@gravityetc.com.au or phone 08 9707 3813 to discuss the options. How much weight can the trampolines take? Our manufacturers recommended a maximum weight of 110kg per trampoline. Absolutely no loose jewellery or earrings. Gravity Etc grip socks are compulsory, available for purchase at entry, for $2.50. No other footwear or socks allowed. Heavy clothing not recommended. Wear something comfy! We recommend exercise clothes such as leggings and a t-shirt, or shorts and a T- shirt. You’ll be pumped with adrenaline from having so much fun, and you will get sweaty. We strongly suggest leaving ALL valuables at home. Bring ONLY what you need to jump. We provide cubbies for backpacks, your shoes or extra clothes, and while this area is under video surveillance, Gravity ETC is NOT responsible for lost, misplaced, damaged or stolen items. You are not allowed to jump with your smart phone. Devices such as Go-Pro’s must be worn (harnessed on), not held. No loose items are allowed on the trampoline arena, so keys, coins and phones must be emptied from pockets, and jewellery removed. Can I watch my kids jump? Yes, you can head up onto the mezzanine and enjoy the view. Feel free to grab a barrista style coffee or head to the retreat if you prefer less noise, no ticket required. Kids aged 5 and under must be supervised by a parent on the trampoline floor. We strongly recommend they attend Lil Gravity sessions or early weekend sessions that have reduced bookings, for maximum safety and enjoyment. Peak sessions could be overwhelming for them. You MUST be 12 years or older to be dropped off without an adult. Student ID must be shown if requested. Refer to “Are there age limits”. We strongly recommend kids attend early morning weekend, or weekday school hour sessions, for their own safety and maximum enjoyment. This age group MUST be supervised by a jumping parent, while on the trampoline arena. Lil Gravity 1 hour sessions with special pricing for pre-school kids aged 3 to 5 are available on Tuesdays and Thursdays from 9:30am – 11:30am (Jump time ending at 11:30am), with free jumping for one supervising parent or guardian. Our rules are designed to keep your little one safe. There are no discounts for this age group or accompanying parent during any other session times. Absolutely MUST be supervised by an adult parent or guardian over the age of 18. The supervisor can either be a paying jumper, or supervise on the trampoline arena or from our awesome mezzanine level. Management reserve the right to remove a jumper from the trampoline arena if the parent or guardian is not available during the jump time. This age group can access the entire floor, with the exception of the performance trampoline if they are under 110cm tall. General admission rates apply. Jumpers 12+: Can jump on their own, unsupervised, as long as the terms and conditions are acknowledged and waiver signed by parent or guardian over the age of 18. Student Identification may required at checkin. Can I drop my kids there unsupervised? Children MUST be 12 years or older to be dropped off without a supervising adult. Note: a student ID card or other acceptable photo ID must be shown upon request, if age is in doubt. A waiver MUST be signed, with Terms and conditions read by a parent. We may contact parents to ensure they have signed a waiver, and read the Terms and Conditions. If they don’t have a signed waiver, and have no ID to prove their age, they won’t be able to jump. Permission or age confirmation by phone or email is not sufficient. Yes. 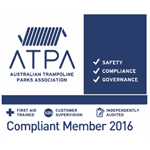 The high performance trampolines/performance wall cannot be utilised by anyone under 110cm tall, unless during a supervised training session. These trampolines are super springy and are only recommended for guests with advanced skills. Spectators are free, and while we welcome you as a guest at our Centre, we only have limited space on an hourly basis, and paying guests will always have priority – therefore management reserve the right to ask any guest to leave after their jump session if necessary. We are open for Parties and Events! We’ve created an awesome range of party and event sessions that can be tailored just for YOU. Please register your interest via our Party Enquiries or give us a call on (08) 9707 3813. To find out more, visit our Parties & Events page.